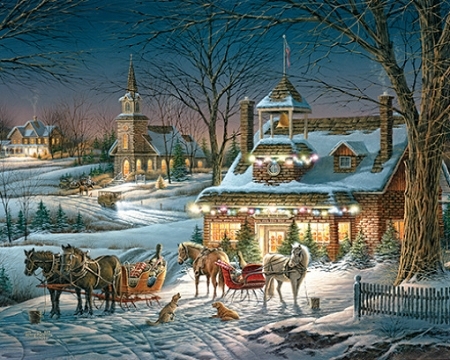 Evening Rehearsals is a beautiful Christmas jigsaw puzzle by popular artist Terry Redlin. In this puzzle, the Christmas concert is coming up soon so the choir has gathered for the final rehearsal. Their sleighs laden with gaily wrapped packages are parked outside, along with their dogs who have enthusiastically joined in the chorus, with the horses as their audience. 1,000 piece Christmas jigsaw puzzle. 24"x30"